Pepper, the world's most important spice, is the small round berry of the climbing vine - Piper Nigrum. No other spice does so much for so many different types of food. 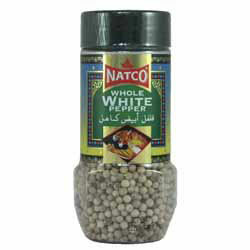 Use for pickling, grinding in a peppermill, and for flavouring soups, meats, poultry, fish and sauces. "Dear Spices of India, Hi there, I have just received my first order from you and it's great. Expertly packed and fast delivery. I'll be back for sure! All the products are exactly as you described on the website. Well done with excellent customer service ........if only everything in life were so simple. 5***** Thank you."